Welcome to the Irvine Police Department (IPD) webpage. As you know, the City of Irvine is a wonderful place to live, learn, work, and worship, and we are grateful as your police department for your continued partnership as we work together to maintain a safe, world-class community. Our website is designed to share information with you about available resources and the work we’re doing here at IPD as we strive to provide you with the highest level of quality service. One of the best things about Irvine is that we are dynamic and diverse. We are made up of people from cultures and countries all over the world, but this also means that various community groups may have specific and unique needs. We are here to do all we can to help address your needs. It doesn’t matter where you come from, your lifestyle, what language you speak or what religion you practice, we are your police department and we are here for you. We hope the information on this site is helpful and valuable, and we look forward to continuing our strong relationships with you, our community. The Irvine Police Department (IPD) has teamed with LexisNexis to provide crime data in a user-friendly map format. The crime map can be accessed at irvinepd.org and clicking Crime Map. To further serve the public, IPD is also now offering an online option for reporting certain types of crime. Text to 9-1-1 is a tool to send a text message to reach 9-1-1 emergency call takers from your mobile phone or device. This service is aimed to assist people who are hearing impaired, speech disabled, or someone who is in an emergency situation where calling 9-1-1 is not possible. Irvine is the Safest City of its size for Part 1 violent crime, FBI data for calendar year 2017 shows. 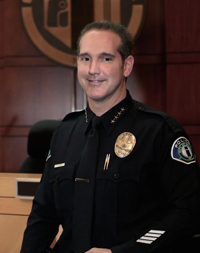 The information released Monday shows that Irvine has the lowest rate of violent crime per capita of any city in the nation with a population of 250,000 or more.